Tryouts are held for all levels of Division Play and Power classes. Spring 2019 trouts begin on Thursday, January 10 and are held on the dates below. REGISTRATION FOR SPRING 2019 TRYOUTS OPENS ON DECEMBER 31. For more information on how to register, click here. At Division Play tryouts, you are assigned to a tryout group. For Divisions 1 and 2, you will try out by playing a short volleyball game with the rest of your volleyball group, using a 6-2 or 5-1 system of offense. For Divisions 3 through 10 (and PowerPlay), you will be doing some warmup drills (with the drills changing depending on the skill level of tryouts), and then play on the court rotating in and out with the rest of your group. Then, teams are created by elected captains who watch all the tryouts using a draft system. Anyone who would like to be considered during the draft needs to register online during the tryout registration period. You only need to try out one time for each tryout day. For example, Divisions 6, 7 and 8 try out on a Saturday and Divisions 9, 10 and our PowerPlay program on a Sunday. If you are trying out for Divisions 6 through 10, you’ll only need to try out once during the tryouts for Divisions 6, 7 and 8, and then if you don’t make a team in those divisions, once during the tryouts for Divisions 9, 10 and PowerPlay. 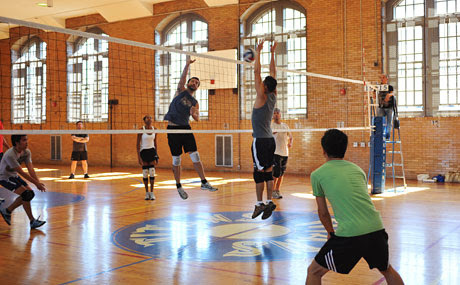 PowerPlay For Beginners: If you are new to Gotham and volleyball, and want to play in our PowerPlay division for beginners who want to learn the fundamentals, register for PowerPlay (you can also register for higher Divisions as well) come to Division 9 and 10 tryouts, and tell us you want to do PowerPlay. We also recommend that you register for Division 10 as well, just to keep all options open. If you are new to Gotham and want to know what level is right for you, click here. Power has two types of training classes — individual and team. For individual Power classes (Power A-E, W, and PowerPlay), Players are selected by class coaches at tryouts. For Team Power classes (Team Power BB, B1, and B2), you try out as a team and teams are selected by coaches at tryouts. For both kinds of classes, tryouts consist of a mock Power Class, going through a series of skill-based drills. If you never played in Division Play before or you last played more than 3 seasons ago, you have to come to tryouts in order to be selected for a Division Play team. You must attend on the date indicated. There are no “make up” days for tryouts. If you played in Division Play within the past 3 seasons and would like to move to the higher division, you have to come to tryouts in order to be selected for a higher division. You must attend on the date indicated. There are no “make up” days for tryouts. If you played in Division Play within the past 3 seasons and are interested in only being considered for your current division or lower, tryouts are optional but you still must register in order to be considered for a team. As with every season, your name will be included on the list of eligible players we give to the captains, but we cannot guarantee anyone whether or not they will be picked. In the Fall Season, everyone must attend Power tryouts in order to be considered for a class. In the Spring Season, you must attend Power tryouts if you are new or looking to move to a higher class. But, if you played in the Fall season and want to remain in your class, you do not need to attend unless your coach tells you otherwise. TRYOUT TIMES: If you are trying out for Division 1 and/or 2, please arrive by 6:30 PM. Important Note: You only try out once for any and all divisions that are selecting players on a particular day. If you arrive late, you may not be able to try out for a particular division. If you arrive earlier, you may have to wait. TRYOUT TIMES: If you are trying out for Division 3, arrive by 9:30 AM; for Division 4 and Division 5, by 12:00 PM. Important Note: You only try out once for any and all divisions that are selecting players on a particular night. Arrive by the time listed for the highest division you are trying out for. If you arrive later, you may not be able to try out for a particular division. If you arrive earlier, you may have to wait. For example, if you are trying out for Division 3 (including if you are also trying out for 4 and/or 5), arrive by 9:30 AM; If you are not trying out for Division 3 at all but are only trying out for Divisions 4 and 5, or 5 only, arrive by 12:00 PM. 9:30 AM — If you are registered for Division 6 only, Division 7 only, and Divisions 6 and 7 (do not come at 9:30 AM if you are registered for Division 8). 10:30 AM — If you are registered for all three Divisions (Division 6, 7 and 8). 12:30 PM — If you are registered for Division 7 and 8 or Division 8 only. There may be a substantial wait after you check in on-site, so we strongly recommend registering for these Divisions no later than January 23 to use the advance court registration option. Be sure to register for tryouts early! If so, you will get to sign up for your court and get the specific time of your tryout in advance of tryouts. TRYOUT TIMES: Tryouts for Division 9, 10 and PowerPlay will start at 9:30 AM. Important Note: Those who miss the January 27 tryout for PowerPlay can come to the Power tryouts on February 3 in order to try out for PowerPlay. For more information about our PowerPlay program, click here. We encourage members to register for as many Divisions as possible to maximize their opportunity to be selected. TRYOUT TIMES: Tryouts for Power A, B, and C tryouts will be from 12:00 – 3:00 PM. Power D, E, and PowerPlay tryouts will be from 3:00 – 6:00 PM. Important Note: You should attend the tryout for the highest Power class you will be trying out for, and you only need to try out once. You will receive an email shortly before the tryout with specific instructions based on your registration criteria. Power W is our Power class for intermediate and advanced women players and is the only Power class using the women’s height net. If you have a team that is interested in training in our Team Power program this season, please contact [email protected] for more information. Contact [email protected] for more information about Team Power tryouts.